Layers can freshen up your hairstyle and add more volume. The best thing about layers is that they flatter any face shape and work equally well with straight or curly hair. In this post, we will give you a few tips how to prepare your hair for layering, cut it and finish the look in a professional way. First, check your hairstyle out in the mirror. Take your time, examine your hair and decide where you want the layers to be. You might want long, natural-looking layers or bold, sharp distinctions between the different hair lengths. To make the decision, consider the texture of your hair. Layers will add body to the hair. If you have thick or curly hair, go for long layers, which won’t differ too much in length. If your hair is straight, consider having some shorter layers to frame your face. The shape of your face is another important thing to consider. Long layers look great with round or square faces, while shorter layers are perfect for oval or heart-shaped faces. If you’re trying to get the hairstyle of a celebrity or just some popular hairstyle, you need to figure out how to make it work for your hair. Decide where the layers should fall, how your hair will be parted, and how you’ll style it in the end. If you’re planning to cut your own hair, you should invest in a good pair of scissors. You should get a sharp, professional-grade pair of barber scissors. Craft scissors or kitchen scissors will not leave you happy with the final result. Go to a beauty store or drugstore and pick a pair of good scissors. Decide on the place, where you’re going to cut your hair. It should be well-lit with access to a sink and a mirror. The bathroom is a good choice. Prepare a towel to drape over your shoulders, a few hair clips to hold back sections of your hair, the scissors and a comb. If you want to check out the back of your hair, you will also need a second mirror. When you’re ready to get started, wash your hair, comb it with a wide-toothed comb to get rid of any tangles and dry it with a towel, so that it’s damp, but not dripping. Start by dividing your hair into sections. You want to make sure the layers on either side of your head are the same length. Dividing the hair into sections will help you achieve this. Make a top box section. This is the section of hair between two layers. Use a comb to create two parts – on the left and on the right side of your hair. Then, divide the top box into two parts – one part should extend from the crown of your head to your forehead, and the second part should extend from the crown of your head to the nape of your neck. Use hair clips to keep the sections in place. You will also need to make right and left front sections. They should start at your temples and end at the top of your ears. Comb them out and hold them up with hair clips. Leave the back sections loose. Since you won’t be cutting the longest part of your hair, you need to leave it down as a guide against which to measure the length of the layers. After you’re done parting your hair, unclip the front top box section, lift the hair at a 90-degree angle from your head and hold it straight between your forefinger and middle finger. Holding it like that, bring the hair down in front of your face and slide your fingers towards the tips of your hair to where you want the shortest layer to start. 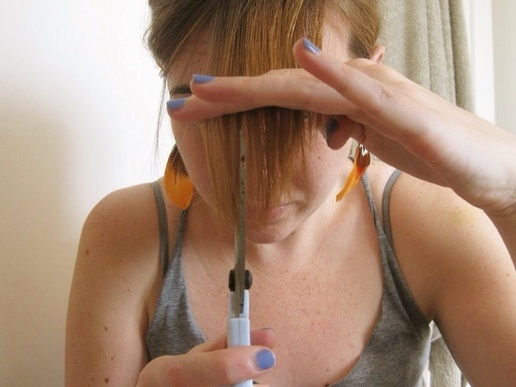 Trim the length of hair sticking out from between your fingers. You may want to cut the shortest layer just below the earlobe or right at the jaw line. Next, trim the right front section. Unclip the right front section of hair and lift it with your fingers at a ninety-degree angle from your head. Hold it straight between your forefinger and middle finger. Bring it down the side of your face and slide your fingers toward the tips of your hair to where you want the side layers to be cut. Trim the length of hair extending from your fingers. To create softer-looking layers, trim at an angle, rather than in a horizontal line. Do the same with the left front section, leveling it to where the right side layer was cut. The next thing to do is trim the back sections. This time, you will need to use the second mirror frequently to check your work. 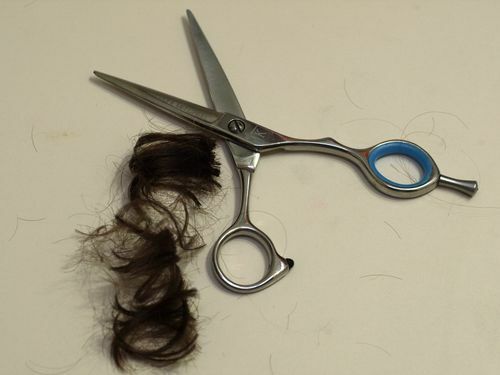 Simply lift small sections of hair and trim them with the scissors. Avoid cutting the layers in the back too short, since they’re supposed to be the longest. Finally, comb the hair out and examine the layers you’ve just created. Make sure they all fall where you want them to. 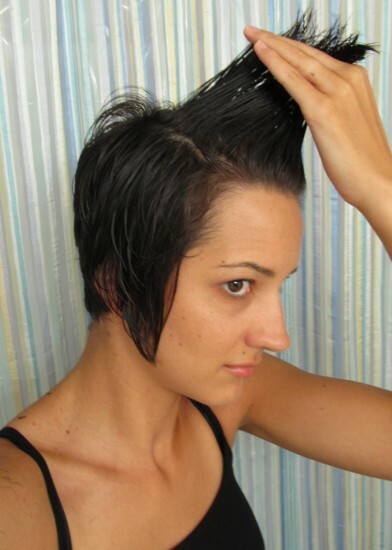 If you see any uneven layers, carefully trim the hair to make them more even. Keep in mind that it is safer to cut a bit longer than your mark and then re-cut to the mark. During the cutting process, re-wet your hair often.